There are 3 different ways to access the Knowledge Base. If you are a TeamSupport user, you have access to the Internal Knowledge Base. This Knowledge Base section on the left hand navigation shows all of the articles that are available to your customers, in addition to private categories and articles that only internal TeamSupport Staff will have access to. 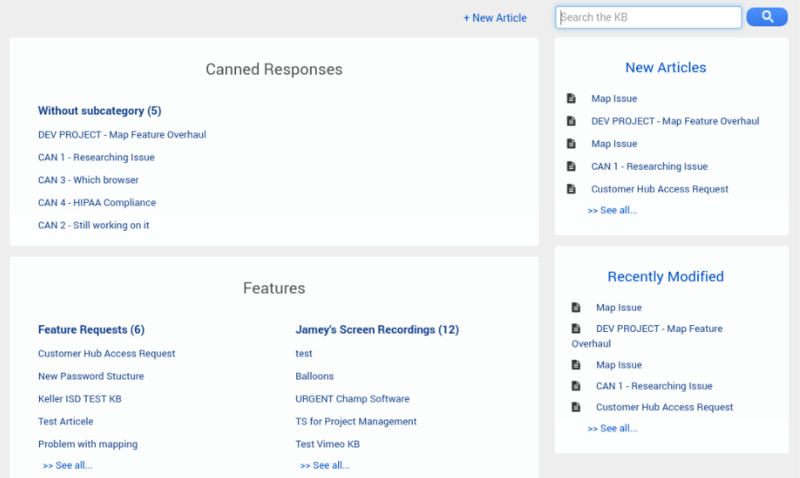 The Knowledge Base is a great place to segregate and display helpful information such as how to configure products, use case scenarios, canned responses, tips and tricks, or various protocols that should be followed. You may give your Customers access to the Knowledge Base through the Customer Hub. You may display your Knowledge Base anonymously. This allows anyone who visits your Hub to have access to your Knowledge Base with out needing to sign in. This is an optional setting found in your Basic Hub Admin Settings. Your customers will require a secure login in order to have access to the Knowledge Base. You may optionally filter Knowledge Base articles based on Product match. Click here to for Knowledge Base setup.